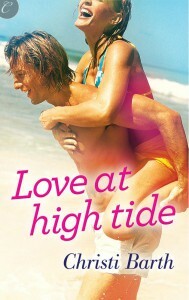 Grab a piña colada, your lawn chair, and a copy of Love at High Tide. Got it? Now you are ready for a perfect summer afternoon! Christi Barth’s contemporaries are always filled with sweet, funny, love stories. And her newest release gives you that, and a little mystery. Darcy and her best friend trail a man at the beach, amateur sleuths that discover more than they can handle. If the thrill of following someone and not getting caught isn’t enough, the spark between Coop and Darcy will be. These two meet in the ocean and are swept away...not underwater, with each other. They both see a one night stand/fling, but as events and others continue to interrupt their romantic interludes they discover the person behind the tempting body just might be the perfect fit. Its summertime, Love at High Tide fits right in.